Ikea recently lowered the prices of WIFI light bulbs. That allone didn't intrigue me much. 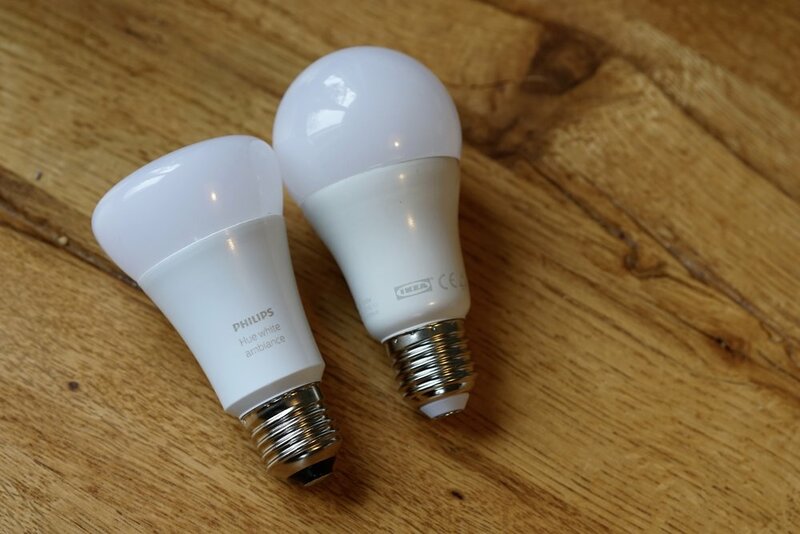 Since I had already bought more than enough Philips Hue bulbs over the last two years. But when someone on Twitter mentioned that you could connect Ikea Tradfri bulbs to a Philips Hue Hub I couldn’t resist. Connecting the Tradfri bulb to the Philips Hub wasn't as easy as I had thought. It didn't work at first. The new bulb didn't show up in the Hue app. Since I didn't have an Ikea Hub and therefore no way to communicate with the new Tradfri bulb I tried a factory reset. I turned the bulb on and off six times. Lucky me it worked. And the Tradfri finally showed up in the Hue app. It turns out there isn't any noticable delay between the Philips and Ikea bulb. But the Ikea bulb takes a little longer to turn off. But that’s not bothersome at all. The only downside: The Ikea bulb doesn't show in Apples Homekit app. Apparently that only works with an Ikea Hub. But that’s not something I'm going to try anytime soon. I just use my Ikea bulb in a lamp connected to a motion sensor. So I don't need Siri or Homekit to control it.